It is with great sadness that the Club has to report the death in an Isle of Man nursing home of Geoff Duke OBE at the age of 92. First with Norton and then Gilera Geoff was motor cycle racing’s first superstar. He won six World Championships and six Isle of Man TTs between 1949 and 1959. He contested 60 World Championship races of which he won 33, finishing on the podium in a further 17. In 1951 he was voted Sportsman of the Year (the equivalent of today’s BBC Sports Personality of the Year) with over 50% of the vote. In 1953 he was awarded the RAC Segrave Trophy, the OBE and was elected to Full Membership of the BRDC. By then Geoff had tried his hand in cars, having been signed up for the Aston Martin works team by John Wyer the previous year after a test session in which he had been faster than all the regular drivers. His outstanding drive in an Aston Martin DB2 on the challenging and treacherous Swiss Grand Prix circuit at Bern to finish fourth behind the three factory 300SLs of Karl Kling, Hermann Lang and Fritz Riess so impressed Alfred Neubauer that he offered Geoff a contract with Mercedes-Benz which Geoff declined to concentrate on his motor cycle racing career. Geoff’s time with Aston Martin was short-lived and he did not return to cars until after his retirement from bikes in 1959. He contested several Formula Junior races in a Chequered Flag Gemini-Ford Mk 2 and a few Formula 2 races in a Lotus-Climax Type 18 run by Tim Parnell but the results were disappointing. Geoff’s final race was also his only Formula 1 start, the 1961 Kanonloppet at Karlskoga, Sweden in an old Cooper-Climax T45, the gearbox of which seized on the first lap; in the ensuing crash Geoff sustained serious injuries which led to his retirement from racing. Born in St Helens, Geoff was a proud Lancastrian and never forgot his roots, at times displaying a prominent red rose emblem on his helmet. He pioneered the use of one-piece racing leathers and in this and other ways changed the image of motor cycle racing. 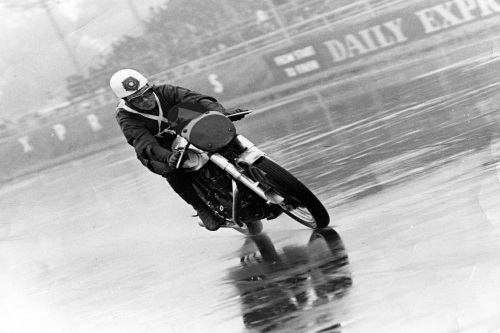 Although the best paid rider of his time, his support for a strike by the impecunious privateers in search of improved start money led to Geoff being banned for the first six months of 1956 at a time when he was the 500 cc World Champion. Geoff Duke will always be remembered as a motor cycle racing legend. Condolences have been sent to Geoff’s wife, Daisy and family. The funeral cortege will do a tour of the TT circuit on Sunday 10 May before a private family funeral on Monday 11 May. Donations welcome to the TT Rides Association, please contact francesthorp@mnx.net. A memorial service is to be organised for later in the year - details to follow.